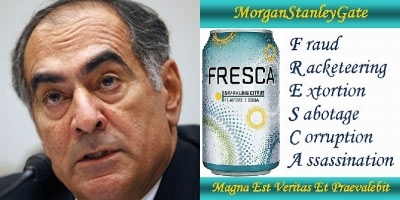 I began to realize the astonishing degree of Morgan Stanley's engagement in criminal activities in the late Spring of 2007 involving Fraud, Racketeering, Extortion, Sabotage, Corruption and Assassinations ("FRESCA" crimes) and how John Mack's return to Morgan Stanley in July 2005 had ramped up such activities, which very much continue today. And it was then that I began to expose those actions through a variety of what are best described as highly creative means (more on this at a later date). 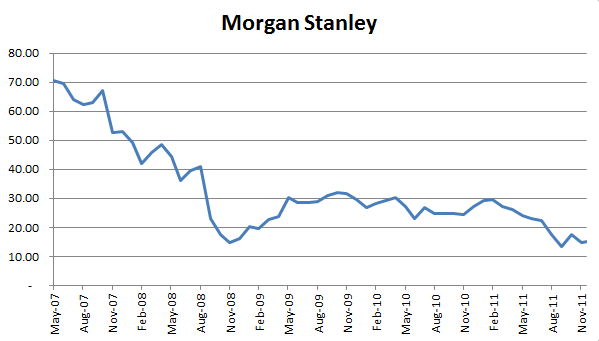 At the end of May 2007, Morgan Stanley's stock price closed at $70.59 and today it closed at $14.98, representing a decline of 79%. Based on the number of shares outstanding at these two junctures, $46 billion of shareholder value has been wiped out by the actions and policies of a supremely incompetent and incorrigibly evil, John Mack, who remains Chairman of the Board. 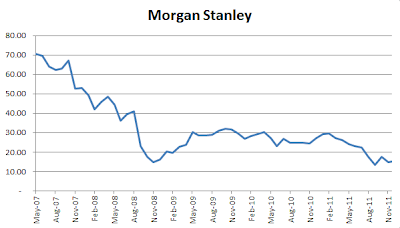 Today Fitch also lowered Morgan Stanley's viability rating as a going concern to what is just a few notches above "junk" in Wall St. parlance. Karma? You be the judge.